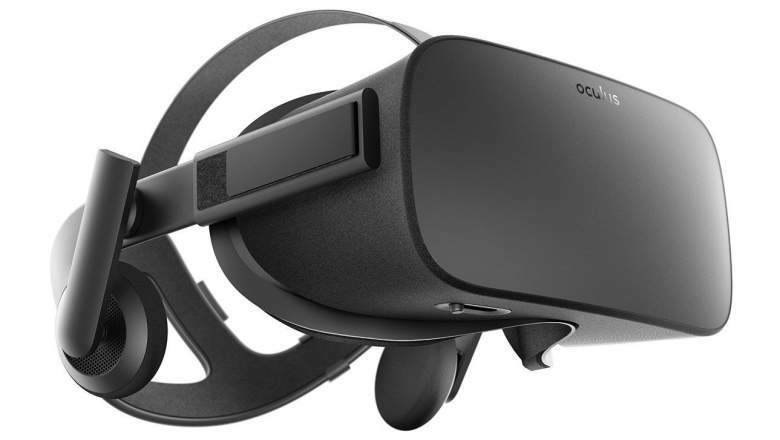 VR platforms and technologies are rapidly improving and we develop VR & AR apps for many of the leading technologies: Oculus Rift, HTC Vive, Google Daydream, Google Cardboard and Samsung Gear VR. We assist our clients in deciding which technology matches their desired goals and budget and help them understand the benefits of each platform. There are two main flavors of VR. freedom of movement and the level of user tracking. Considered the more immersive of the two formats of VR, Desktop VR involves head mounted displays (HMDs) that are tethered to a robust PC. With Desktop VR, your visuals are generated from the powerful graphics card of the PC and projected through the display in the HMD. You may also have other inputs such as hand held devices that track your hand position and are used to select and interact with items in the virtual space. Room-scale tracking is a key advantage to DesktopVR. The external sensors and sensors in the HMD and hand held controllers allow for room-scale tracking of the user’s whole body. Immersion in this format is more complete as it tracks the user’s movement of both the body and the head. This allows the user to virtually move around the virtual space. 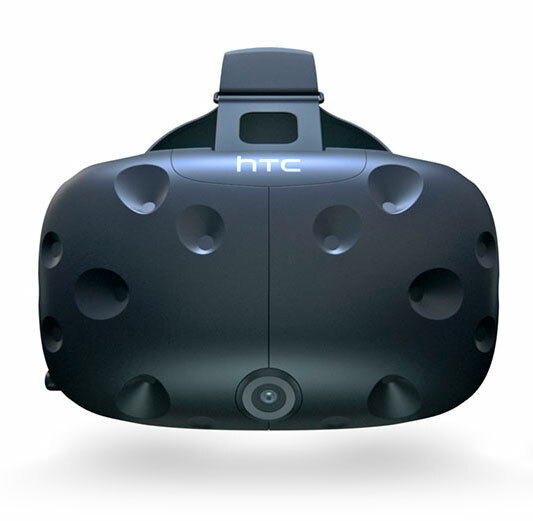 The HTC Vive was developed by HTC in partnership with the gaming company Valve. It is arguably the best VR device on the market in terms of resolution and immersion. Excellent room-scale tracking is achieved via laser towers that beam to the headset. Hand-held controllers allow the user to interact more seamlessly with the environment. The HTC Vive is excellent for larger scale experiences that benefit from its tracking capabilities. One of the two top-tier VR headsets. The built in headset and audio programming allows for true 3d audio spatialisation increasing the immersive experience and sense of “being there”. Room-scale tracking is achieved when using up to three sensors. Most applications are intended for seated or stationary use. Mobile VR works by pairing a smartphone with a portable VR device to generate the VR experience. Because it uses the phone as its mode of display and processing, Mobile VR is the most scalable version of VR and the most accessible to the masses. The trade-off of accessibility and mobility is in the quality of the rendering and the complexity of the experience. Mobile VR allows for head tracking and is untethered from a computer. Some devices utilize a Bluetooth controller for selection and interaction. Head tracking allows the user to look up and down, side-to-side but there is no positional tracking which you won’t be tracked moving forward or back. This makes the experiences mostly stationary but you have the ability to look around the environment with your head. Mobile VR uses your smartphone to run a VR mobile app to produce visuals in a split screen stereo image. Slip the phone into the VR device (not always made of cardboard) which then separates the split screen image. The VR device can either be hand held or strapped on to your face. Mobile VR is a less expensive mode for delivering VR and is best used in shorter VR experiences from 3-5 minutes. It is ideal for events and conferences. Google Cardboard is an inexpensive hand-held VR device meant to encourage interest in VR and intended for shorter VR experiences, what Google calls “snackable VR”. Many devices are made from cardboard materials with plastic lenses, but some are made of more durable plastic. 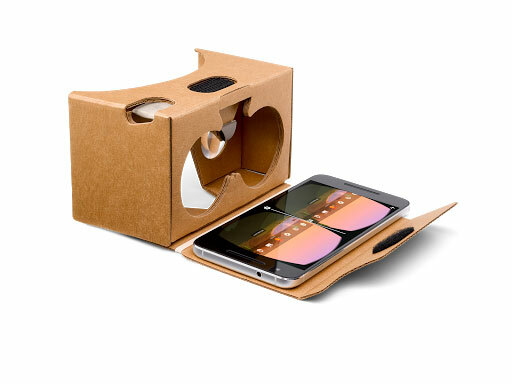 You use the Cardboard device in conjunction with a Cardboard VR app on your smartphone. Works with both Android and iOS platforms. The device is handheld. User gaze, touch or head movement can be used for interaction. There are many manufacturers of the VR Cardboard devices. Our sister company Kinmode has designed an easy one-step pop-up Cardboard viewer, the VRnocular. Google’s upgrade from their Cardboard version, the Daydream View is made for comfort and performance. 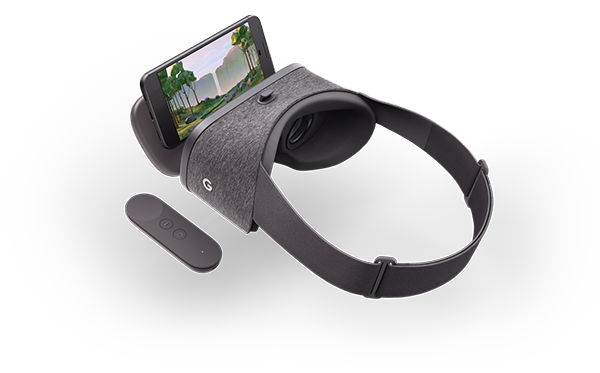 It needs a Google Daydream-ready mobile phone to run the VR apps and display the stereoscopic images. The high-performance phones with large displays and advanced sensors allow for fast and smooth tracking and high resolution images. It features a Bluetooth controller that allows you to select and interact with the VR experience. The controller takes on different roles depending on the environment you are in. For example, it can be a wand or a flashlight. It allows you a more natural interaction in the virtual world which increases the feeling of “being there” in the digital environment. Developed by Samsung and Oculus Rift. 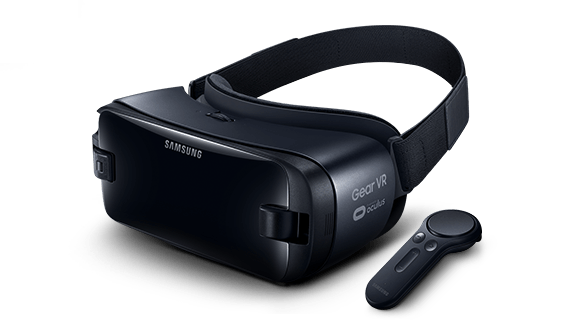 This mobile VR headset utilizes newer, more powerful Samsung phones, to generate and display the stereoscopic images for VR. The VR viewer is made from sturdy plastic and features additional sensors to assist in head tracking. It is a solid unit that is easy to pair with a Samsung device. It works well for event activations where you can have several units in a single booth. The 101-degree viewing angle improves your viewing experience. The new handheld controller allows for additional manipulation of the environment and easier selection and interaction. What defines Augmented Reality (AR) from VR is the amount of transparency provided in the display. With VR you are fully immersed in the digital image. The “real world” is not visible when using a VR device. With AR, the user is seeing digital information superimposed on top of the real world. Imagine Tom Cruise in “Minority Report”. That’s not where the technology is yet, but that is the idea. AR is ideal for product demos, training, education and retail applications. Lowe’s has successfully been using AR to direct customers through their large warehouse stores. And we all know how Pokemon Go Mobile AR app went down. That app was a spectacular win for AR and put AR on the map for the general consumer. Some AR devices have the ability for fixed spatial placement of digital models. What this means is the device maps the physical space and is then able to place the 3D digital model in space as if it were actually there. Microsoft Hololens is a mixed reality headset that overlays holographic images onto your physical environment. and interact with the digital holograms in your space. Cameras and sensors in the headset track your position in space as you move around digital objects. It is hailed by some as the future of computing and we see it as an excellent marketing, educational and training tool. The applications are truly limitless for this piece of tech. We are very excited to be working in this space. Google Tango is an advanced platform for augmented reality that work on specialized Google Tango-ready smart phones. The phones are equipped with an array of powerful sensors and cameras that map your physical space. The cameras allow the phones to see 3D depth. This allows you to position and track virtual 3D objects in space without the use of a QR code type marker or GPS. Hold up the phone and you will see digital images overlaid on the real world. The virtual image is fixed in space and the user can walk around it. It is like the Microsoft Hololens but on a phone. There are only a couple of Tango enabled phones at the moment, but that will soon change as the marketing and educational potential grows. Mobile AR has the likes of Apple and Facebook all excited about the potential of this platform. Remember Pokemon Go? That Mobile AR application only scratched the surface of the tech and it was hugely popular. Mobile AR uses your smartphone to overlay digital information onto the real world. Because it is viewed through any smartphone’s camera, it is a highly accessible platform. A Mobile AR app runs on your smartphone and uses physical markers or GPS to track where the user is and correctly position the digital objects. Just point the smartphone camera at an object or print image and digital 3D content is triggered.